Definition at line 278 of file commdlg.h. Definition at line 292 of file commdlg.h. Definition at line 284 of file commdlg.h. 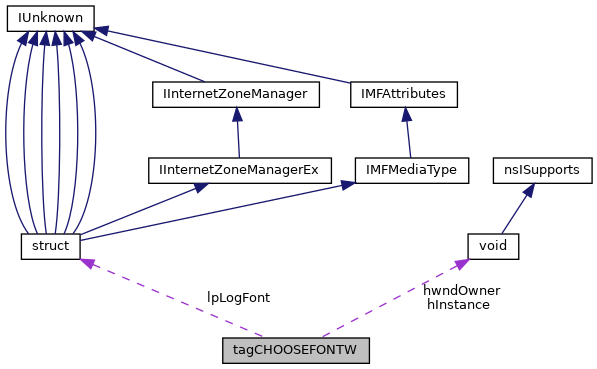 Referenced by AddFontFamily(), AddFontSizeToCombo3(), CFn_GetDC(), CFn_HookCallChk32(), CFn_ReleaseDC(), CFn_WMCommand(), CFn_WMDestroy(), CFn_WMInitDialog(), choose_font(), and ChooseFontW(). Definition at line 281 of file commdlg.h. Referenced by CFn_GetDC(), CFn_ReleaseDC(), and choose_font(). Definition at line 289 of file commdlg.h. Referenced by choose_font(), and ChooseFontW(). Definition at line 280 of file commdlg.h. Referenced by CFn_WMCommand(), CFn_WMInitDialog(), choose_font(), and ChooseFontW(). Definition at line 283 of file commdlg.h. Definition at line 286 of file commdlg.h. Definition at line 287 of file commdlg.h. Referenced by CFn_HookCallChk32(), choose_font(), FormatCharDlgProcA(), and FormatCharDlgProcW(). Definition at line 282 of file commdlg.h. Referenced by CFn_WMCommand(), CFn_WMDestroy(), CFn_WMInitDialog(), CFn_WMPaint(), choose_font(), FormatCharDlgProcA(), and FormatCharDlgProcW(). Definition at line 290 of file commdlg.h. Referenced by CFn_WMDestroy(), CFn_WMInitDialog(), choose_font(), and FormatCharDlgProcA(). Definition at line 288 of file commdlg.h. Definition at line 279 of file commdlg.h. Referenced by CFn_WMInitDialog(), and choose_font(). Definition at line 291 of file commdlg.h. Referenced by CFn_WMCommand(), and choose_font(). Definition at line 294 of file commdlg.h. Definition at line 293 of file commdlg.h. Referenced by AddFontSizeToCombo3(), CFn_WMCommand(), and choose_font(). Definition at line 285 of file commdlg.h. Referenced by CFn_WMCommand(), CFn_WMInitDialog(), CFn_WMPaint(), and choose_font().